The University of Maryland is among 231 academic, industry and government partners in the new Advanced Robotics Manufacturing Institute (ARM). On January 13, ARM received $80 million from the U.S. Department of Defense and an additional $173 million from other funding sources. ARM will be headquartered at Carnegie Mellon University in Pittsburgh. At Maryland, ARM efforts will be led by the Maryland Robotics Center, directed by Associate Professor Sarah Bergbreiter (ME/ISR). "Maryland brings a particularly strong group of researchers in the area of perception and sensors for collaborative robotics," Bergbreiter says. "In addition, Maryland contributes state of-the-art facilities and educational opportunities to train the next generation of robot developers." The use of robotics in manufacturing is widespread, but robots are typically expensive, singularly purposed, challenging to reprogram, and require isolation from humans for safety. In addition, while robots are increasingly necessary for defense and other industrial manufacturing needs, their capital cost and complexity of use limits their use by mid-size and small manufacturers. In response, ARM will leverage artificial intelligence, autonomy, 3-D printing and other emerging technologies to make industrial robotics more affordable for businesses of all sizes, adaptable for many uses, and able to achieve more. The institute will integrate a diverse collection of robotics industry practices and institutional knowledge across many disciplines. It will focus on the aerospace, automotive, electronics, fulfillment and logistics industries. 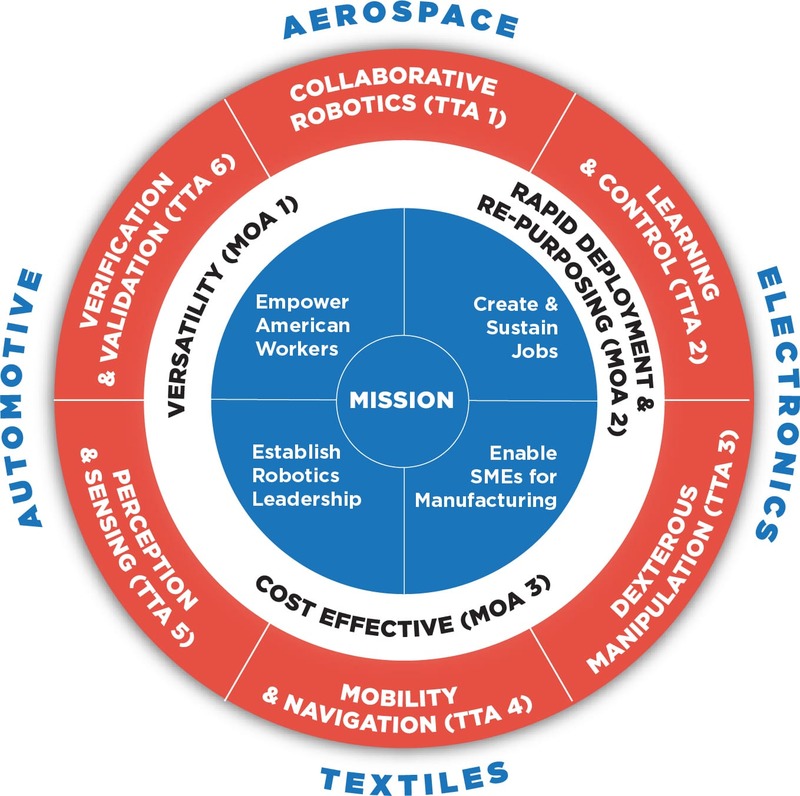 Critical to ARM’s mission is to create a new generation of robots with the potential to create large numbers of new jobs in the U.S. and to fuel the country’s economic growth through advanced manufacturing. ARM will be part of the federal Manufacturing USA research institute network, which focuses on developing and commercializing manufacturing technologies through public-private partnerships between U.S. industry, universities, and the Department of Defense, Department of Energy, National Science Foundation and the Department of Commerce’s National Institute of Standards and Technology. Modeled after Germany’s Fraunhofer Institutes, each Manufacturing USA institute focuses on a technology area critical to future U.S. competitiveness. In addition to robotics, other areas include 3-D printing, integrated photonics and tissue fabrication. The federal government already has committed more than $1 billion to these efforts; the funding has been matched by more than $2 billion in non-federal investment.